Dr. LoRang demonstrates a squat. Squats are a universal human movement, seen everywhere from the basketball court, to the football field, the Crossfit Box, and even among infants learning to walk. It’s what you do if you’re trying to see a product on the bottom shelf at the grocery store. Your feet are roughly shoulder width apart as your knees bend, bringing the backs of your thighs closer to your calves. 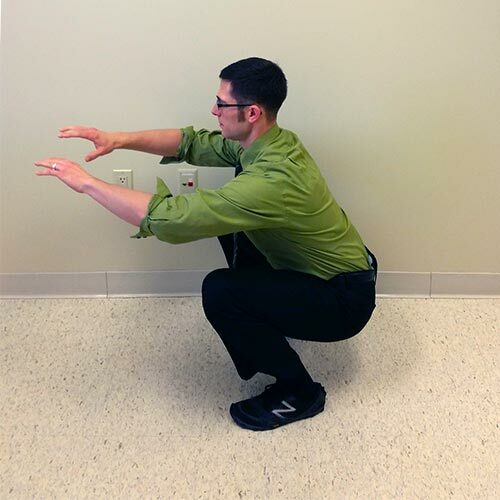 We conduct squat screens with each patient. This is part of our baseline functional assessment, where we assess your movement while jogging, walking, sitting, standing, and – yes – squatting. This everyday movement can hold secrets about our pain, injuries, or discomfort. What we’re looking for is not just IF you can squat, but how. Is the body compensating to complete the squat? Does the movement cause you pain? What can a squat tell us? A squat can tell us a lot. As a global movement, a squat sets off a chain of interactions between muscles, joints, and compensations from head to toe. We screen for them because the quality of the squat can help us predict when and how injury might occur. For example, if the neck hyper-extends, this may indicate that some muscles are too tight and some are too weak. In other words, some muscles might be over-activated while others might be inhibited, which can be linked to shoulder pain, neck pain, and headaches. Or if the low back hyper-extends (curves in), this may indicate a lack of intra-abdominal pressure, which can be linked to low back pain and may indicate that your low back could be vulnerable to injury with your existing motor patterns. In the functional model of health and wellness care, this is the name of the game: To assess how the way you move affects the way you feel and live. And our goal is to help you pursue your best life. Curious about your own squat or other movement patterns? We’d love to talk with you about them. Call us at the clinic at 515-421-4018.